If the violence problem is due to mental health issues, the future is bleak. Is anyone else just emotionally exhausted from dealing with mass shootings in our nation? What happened yesterday, when a young man killed 17 at a high school in Parkland, Florida, is starting to seem like a typical news story. To my mind, it is unbelievable how normative this kind of incident is becoming. So the president seems to be primarily placing blame on the fact that the killer was “mentally disturbed.” The president does not mention gun control or much else in his preliminary statement on this incident. As a professional behavioral scientist, I am disappointed by such a simple characterization of such a significant issue. As I have written about in detail before, nearly all human behaviors are the result of multiple factors (see: Multi-Factorial Causation and the Orlando Shootings). To say that mental instability is the only factor responsible for what happened yesterday in Parkland, Florida is an excessive oversimplification. As is the case with all of the mass shootings we are seeing in our nation these days, there are multiple causes at work. For a second, for argument’s sake, let’s think about the implications of the it is a mental health issue perspective on mass shootings. From where I stand, if this were the case, this would be enormously unsettling for various reasons. Largely, this would be concerning because mental health problems have pretty much been skyrocketing in our nation across the past few decades (see Twenge, 2015). In fact, in a powerful Psychology Today post from 2015, my colleague Jean Twenge provides a mountain of data speaking to the facts that (a) a broad array of psychological disorders, including depressionand anxiety, have increased in frequency since the 1980s and (b) this observed pattern is not exclusively the result of over-diagnosis. In short, our nation is getting less and less mentally healthy with time. And yes, this is a problem. While this pattern is problematic for many reasons, I’d like you to join me in thinking about the implications regarding the future of senseless violence in this country. A simple assessment of this situation is pretty grave. If mass shootings are the result of mental health problems, and if mental health problems are on the rise, then we can only expect the trend in such events as mass shootings to increase. Think about that. To my mind, this constellation of facts is truly grim and gives me great concern regarding our future. Of course, action is ultimately what is needed here. And in a democracy like ours, action often takes the form of embracing the First Amendment and by engaging in the electoral process. We can do things such as writing letters to elected officials, writing letters to the local newspaper, meeting with elected officials and holding them to task, electing officials into office who have a record of taking action on the issues at hand to make a positive difference, and even running for office. If the problem is all about increases in psychological disorders in our nation, then we need to support programs in the fields of psychology and mental health. And we need to particularly support programs that have been demonstrated, through rigorous empirical research, to actually work. And we need to support our colleges and universities with teams of researchers who are studying this topic with the most cutting-edge scientific methods. However, given the fact that each mass shooting is likely caused by a broad array of factors, then if we are really serious about increasing the safety of our nation, we need to address each of these factors. A great deal of research has shown a connection(link is external) between the unique gun laws in the U.S. and the excessively high rate of mass shootings in our nation. The connection is beyond what would be expected by chance. And, in statistical terminology, the effect size is enormous. So while it seems likely that the guy in Florida was mentally unstable, it is also clear that he legally purchased extremely dangerous firearms that ended up being used in the incident. There are at least two foundational causes as to why this event occurred. If we really care about our future, then we need to address both of these issues. When I hear about another case of needless violence and carnage, I get upset. I have always liked to believe that the U.S. is a great nation. It’s hard to see things that way when there’s a mass shooting nearly every day in this country and it seems that our hands are tied as to how to deal with it. One cause of this problem that is often cited pertains to mental health problems. Sure, a lot of these killers have histories of being mentally unstable. But mental health problems are on the rise in this country. So if we really think that the issue of mental health is the primary issue at hand here, then we are in big trouble moving forward. Just saying “be vigilant” is not going to solve the problem. 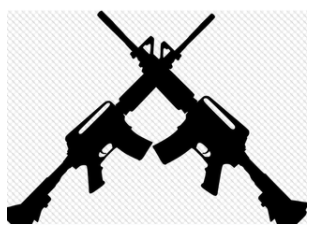 Further, a landslide of evidence has shown that the unique gun culture and gun laws in the U.S. are very strongly connected with the high level of mass shootings in our nation. It seems, then, given all of these factors taken together, that substantially modified gun laws at this time in our history, while mental health issues are on the increase, would be a good idea. For our shared future. Twenge, J. M. (2015). Time period and birth cohort differences in depressive symptoms in the U.S., 1982-2013. Social Indicators Research, 121, 437-454. Unlike at the thousands of schools across the country, zero students walked out of Benicia High School during the National School Walkout. Instead, students held a rally in the quad during Access Period to give speeches on preventing future gun violence and improving their school. Senior Carson Rendell began the rally with a moment of silence for the victims of the Marjory Stoneman Douglas High School shooting in Parkland Fla. on Feb. 14 He then delivered the first speech of day, focusing on the many victims of school shootings and how easily he believed gun violence could be prevented with stricter gun control laws like stronger background checks and bans on assault weapons. happened. The duo also called for more support of mental illness and health care, and criticized arming teachers. Shannon Sweeney, the senior class president, laid out the legislative rules of the Never Again movement: banning assault rifles, expanding background checks, passing gun violence restraining laws and stopping the militarization of police. She then made a call for civic engagement. Upon completion of Access Period, students returned to class. However, one Benicia Unified School District student did walk out: at Matthew Turner Elementary School. Earlier in the morning, Emma Willeford’s mother explained, without going into much detail, why people were protesting and asked Emma if she would be interested in joining the national movement. According to her mother, Emma thought it over and agreed to walk out of school. Around 10 a.m. Emma was picked up by her mother and met outside by her stepsister, who was a holding a protest sign. For 17 minutes, Emma Willeford waited outside as a part of the walkout. When the 17 minutes were completed, Mrs. Willeford signed Emma back into school. Emma’s teachers were understanding of her choice, according to Mrs. Willeford. Mrs. Willeford said she was very proud of Emma. Benicia will next be participating in the March for Our Lives 10 a.m. Saturday, March 24 at the foot of First Street. That was just one of several points made by students who took the small stage in the center of Vallejo’s Jesse Bethel High School on Wednesday, joining a national walkout, organized one month after a gunman took the lives 17 students at Marjory Stoneman Douglas High School in Parkland, Fla.
School administrators estimated that up to 1,200 of the school’s 1,550 students filed out of their classrooms at 10 a.m. for the event, planned to last 17 minutes — one for each of those killed at Parkland — as suggested by the surviving Parkland students. They joined thousands of students nationwide who walked out of class to protest gun violence and urge lawmakers to strengthen gun control laws. One senior, Oliver Saunders, 17, said for him, Wednesday’s event is about demanding gun control. Ren Simbol, a 16-year-old junior, said it was about making a stand on principle. “I feel like I’m part of a historic event,” Simbol said. Some shared umbrellas as protection from the intermittent drizzle, while others had hoods up and still others simply braved Vallejo’s damp, chilly Wednesday morning weather. Trinity Love, a 17-year-old Bethel junior, said she was out in the elements because there have been enough school shootings. “It’s quite terrifying that someone would harm another person just to make a point,” she said. With students holding signs bearing the names and ages of those killed in Parkland, several students spoke their thoughts into a microphone set up under a canopy in Bethel’s quad. Some spoke of living in fear of gun violence in school and demanding the government take action. Others spoke of the loss of innocent lives. But at least a couple reminded listeners that many believe the Second Amendment to the Constitution guarantees the “right to bear arms” for good reason. “But we want improved mental health screening and better background checks,” in any case, said one. Bethel principal Linda Kingston said she was fine with the event, so long as it was student-driven. Bethel’s event was primarily organized by the school’s Law Academy students, she said. Another, related informational event was planned for the lunch break, as well, she said. Organizing and participating in an event like Wednesday’s peaceful and respectful walk-out will help the students develop a sense of power, she said. But, there will also come some hard lessons in the speed with which change is made in the real world, she said. A similar walkout was organized at nearby Benicia High School. A track meet later in the day between Benicia and Vallejo high schools was also related to the national theme but had to be cancelled due to wet weather. Athletes were expected to wear orange ribbons and a moment of silence was scheduled. 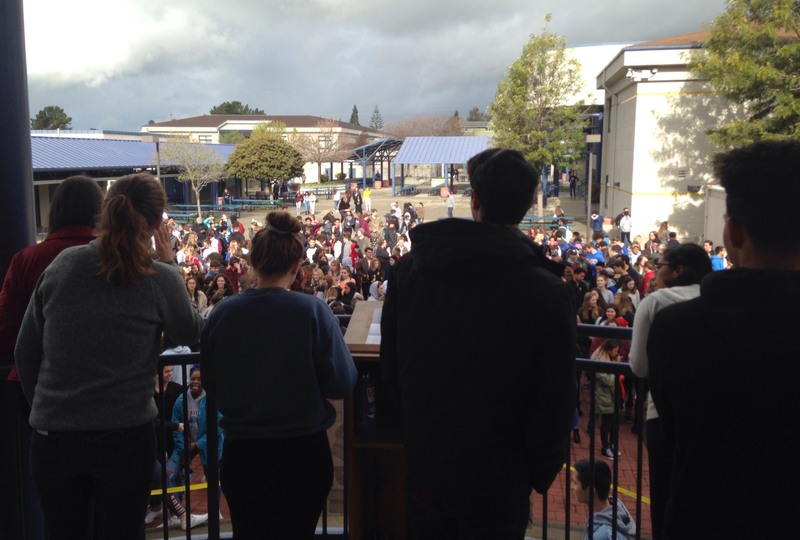 Vallejo High and American Canyon schools held similar walkouts at their campuses on Wednesday.